These metal stamped cuff bracelets are a great way to show your best friend how much you love her! 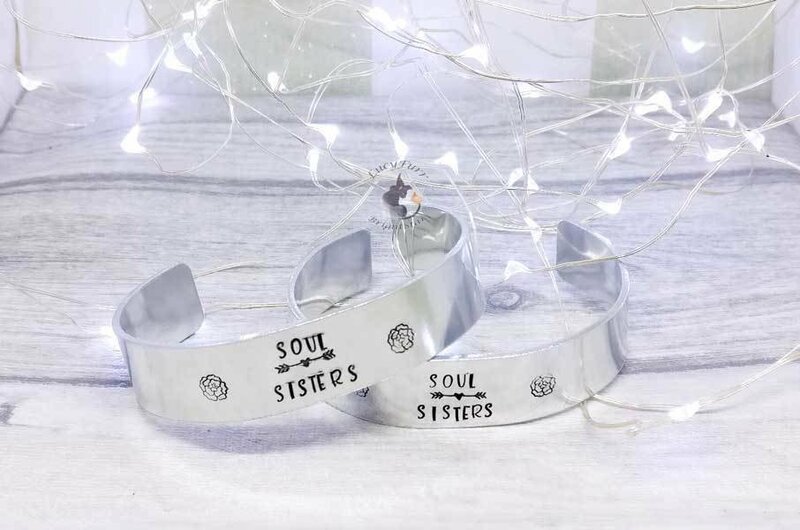 This listing is for a set of 2 metal stamped stamped aluminium cuffs with the words Soul Sister stamped on them. Some say we do not choose your family, I disagree, family is not just people who are related by blood, but also those amazing people that chose to connect with us on amazing levels, and this cuffs celebrate that! Aluminium is great for jewellery as it is lightweight and hypoallergenic which makes it very comfortable to wear. There will be some marks on the back as this cuffs are stamped (metal is pushed down to create an impression) and not engraved (surface is scraped to create and impression), but they are minimal and do not affect the overall look of the bracelet at all. I offer 3 length sizes for the cuffs, please measure your wrist before ordering! Other sizes are available, if none of the three offered suit you then please drop me a message and I can source them for you. The standard size for a cuff bracelet is 150mm. These cuffs are amazing and so easy to wear, just fit then sideways on your wrist then rotate to put in place, if it needs a little bit of adjustment just remove the cuff by rotating it and remove it sideways. Adjust by pulling lightly at each side so as not to put too much pressure on the middle of the bracelet, and repeat step 1. Enjoy wearing your beautiful shiny cuff bracelet. Please bear in mind this item is handmade and each letter and design is stamped by hand individually so there will be small variations from bracelet to bracelet, making each one of them unique.